3 ORTELIUS, A. Theatrum orbis terrarum. ( Anvers, 1579) In-folio de 93 cartes ; veau brun estamp� (reliure ancienne restaur�e). Plats conserv�s, dos, coins et ff. de garde renouvel�s. Forte mouillure dans l'angle inf. droit affectant le titre et les premiers et derniers ff., mouillure moins importante affectant les cartes, quelques rousseurs �parses. La plupart des cartes ont une belle impression bien contrast�e. - Folio, 16th century brown calf binding, spine re-newed, 93 maps, title page and portrait of Ortelius. 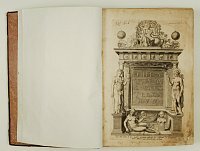 With "Parergon" and "Nomenclator"..
� This is the first edition of the Theatrum printed by Plantin and the first edition with the "Parergon". Instead of the "Synonymia locorum" of the former editions, the maps are followed by the "Nomenclator Ptolemaicus". Plantin printed about 500 copies of this edition, the first copies were delivered to Ortelius on 12 June 1579. There are two editions with the date 1579, this is the first edition. Maps generally in very good condition and dark impressions, with the usual occasional splitting of centerfolds, light marginal water staining throughout, not affecting engraved area, and age-toning of paper. The first and last 3 pages with fraying of paper in lower right corner. The first and last 8 maps with stronger marginal water staining, not affecting printed area. World map with some contemp. backing of center fold, and vertical tear next to lower part center fold, 3 cm into engraved area. Map of America, is an extremely good and dark impression, with a very light brown spot. The map of Africa with a repair of a small tear, using cello tape, causing some light browning of paper. The "Parergon" includes 3 maps (Peregrinationis Divi Pavli Typvs Coroghicvs, Romani Imperii Imago, Graecia Vetvs.) The Nomenclator Ptolemaicus has a letterpress title page, 77 pages naming 120 contemporary mapmakers, 9.pp. with colophon. THE THEATRUM IS GENERALLY CONSIDERED A MILESTONE IN THE HISTORY OF CARTOGRAPHY. "The Picture of the World" is the first large modern atlas. 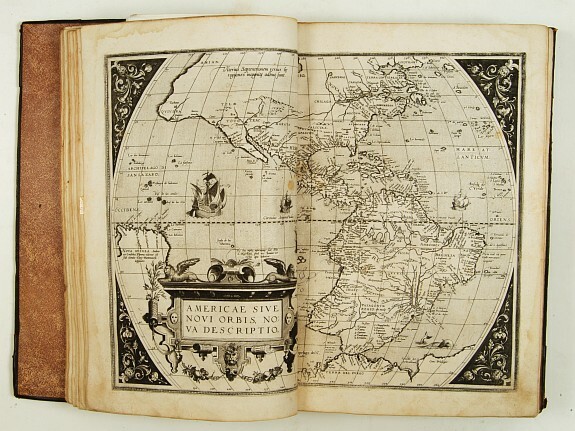 This is the first year Ortelius atlas was printed by the master printer Plantin. Ortelius developed a wide circle of acquaintances among European cartographers, whose maps he collected into the Theatrum. This was an immediate success, since it gathered together (engraved by F. Hogenberg) the best available maps, and thus presented a complete picture of the whole world, with scholarly citations of authorities and descriptions of the topography and antiquities. 4 ATLAS composite. MAGINI / MERCATOR / JANSSON / HONDIUS (Theatrum Italiae). ( Amsterdam, ca. 1635) In-folio de 65 cartes en coloris d'�poque, veau brun, dos � 7 nerfs orn� (reliure de l'�poque). - Folio, contemporary brown calf, used. Paper slightly age-toned as usual, 3 maps with lower margin cut into the neat line. In beautifull contemporary colours..
� Magnifique atlas composite comprenant principalement des cartes d'Italie, dans un coloris exceptionnel et sans texte au verso. Page de titre et 2 ff. de table manuscrits. - On peut comparer cet exemplaire au "Theatrum Italiae", �dit� par J. Jansson en 1635. Dans cette �dition, les cartes n'ont pas de texte au verso. De plus l'exemplaire cit� (Brussel KB), comme le notre, est plus une collection de cartes, ne comportant ni page de titre, ni table imprim�e et auquel, ont �t� ajout�es des cartes par Mercator. Notre exemplaire contient �galement 10 cartes par Magini. - Contenu : MERCATOR : 7 cartes, Tarvisina, Veronae, Forum Iulium, Macedonia, Pedemontana, Puglia. JANSSON : 24 cartes, Verona, Cremasco, Bellunese, Friuli, Istria, Milano, Pavia� Lodi, Piemonte, Vercelli, Republicae Genuensis, Riviera di Genova Ponente (l�ger manque en bas de carte), Riviera di Genova Levante, Modena, Ischia, Ferrara, Bolognese, Orvieto, Patrimonio� Campagna di Roma, Contado di Molise, Capitanata, Terra di Bari et Basilicata, Calabria Ultra. HONDIUS : 23 cartes, Italia 1631, Dominiu Venetum, Bergamo, Brescia, Vicentinum, Polesino, Padovano, Trevigiano, Graecia, Attica, Parte Alpestre.. di Milano, Cremona, Parma, Siena, Chiesa (coup� en bas sous le filet d'encadrement), Romagna, Perugino, Umbria, Urbino, Neapolitanum Regnum (manque d'environ 5 mm en bas), Lavoro, Abruzzo, Principato Citra, Otranto, Calabria Citra. 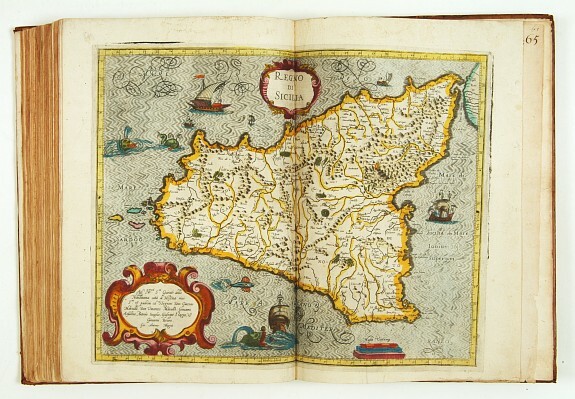 MAGINI : 10 cartes, Italia Antica, Milano, Montferrato, Mantova, Lucca, Marca d'Ancona, Abruzzo Ulteriore, Corsica, Isola di Sardegna, Regno di Sicilia. - Ex-libris : Charles Filippi. - AN EXPERIMENTAL ATLAS : "From 1630 onwards the firm of Henricus Hondius and Joahnnes Janssonius had to compete with Willem Jansz Blaeu and his son Joan Blaeu in the publication of atlases. Blaeu published his first atlas, the "Atlantis Appendix", in 1630. It contained 60 maps partly made from copperplates that Blaeu acquired from the estate of Jodocus Hondius Jr.. The latter died in 1629. To fill the gap caused by this transaction with their competitor, Henricus Hondius and Johannes Janssonius orderd 36 new plates in March 1630� Following these "Appendices" a new "experimental" atlas was published in three parts, in 1631, 1632, and 1635 respectively with editions by Janssonius and by Hondius. In this new project, Janssonius decided to follow the classical composition of Mercator's "Tabulae Geographicae" i.e. first a part Gallia, next a second part Germania, and finally a third part Italia : "Theatrum Italiae", 1635 by J. Janssonius and undated by H. Hondius. Just as the "Appendices" the "Theatri" contain no text, except for a letterpress title page and a table of contents. Probably the main use of these atlases was to serve as collections of maps to be added to older atlases. This way of using the "Appendices" and "Theatri" can explain the extreme rarity of these editions." With manuscript title page "Liste Dea cartea particulirea de France Et autrea contenuea en ce presant volume. A Paris Se vendent Chez Lautheur MDLXXIX Avec Privilege du Roy." 3 pages of manuscript index in a 18th century hand, counting maps 1-65. Provenance: Charles Filippi. 5 ROBERT DE VAUGONDY, G. / DELAMARCHE. 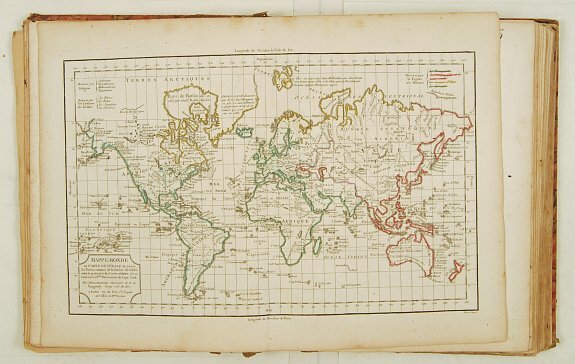 Nouvel Atlas Portatif destin� principalement� ( Paris, 1795) Atlas in-4 de 1 titre grav�, 2 ff. d'introduction, 2 ff. de table et 54 cartes aux limites en col. d'�poque. Rousseurs et taches d'encre sur quelques cartes, large d�chirure dans la carte d�pliante de France. Reliure carton usag�e, 1 plat d�tach�..
� L'atlas comprend 2 cartes suppl�mentaires : carte de la R�publique Fran�aise An VII et carte N� 47 en double. Mappemonde dat�e 1795. Apr�s la r�volution le Sr. Delamarche devient le Cit.en Lamarche! - Uncommon later edition of this attractive atlas containing one world map in double hemisphere and 3 identical world maps in Mercator projection, 4 of the Holy Land each in a different colouring. Five maps relating to the Americas. With folding map of France not in index : Carte de la R�publique Fran�aise Divis�e en 103 D�partements. - Sponberg Pedley, Bel et Utile, p.231 (Not mentioning this variant). 6 MANEN, L et HERAUD, G. Reconnaissance hydrographique des C�tes de Tunisie. 1882 - 1886. Atlas. ( Service hydrographique de la Marine, 1890) Grand in-folio ; (1) f. de titre, (1) f. de table et 39 cartes ; demi-chagrin brun � coins. (Reliure de l'�poque usag�e). Infimes rousseurs..